In the aftermath of World War 2, concentration camp survivor Nelly (Nina Hoss) receives surgical facial reconstruction after being heavily disfigured. The operation almost captures her previous appearance - the doctors use old family snapshots as a guide - but is slightly off, which makes her unrecognisable to her former husband Johnny (Ronald Zehrfeld), who is certain that she was killed. He notices her in the Phoenix club he now works in and, stricken by the resemblance, he conjures a scheme to mould her into the image of his supposedly deceased wife in order to get access to a substantial inheritance. Nelly’s role in the process is complex, particularly considering her roommate Lene’s (Nina Kunzendorf) insistence that her husband was the one who turned her in to the Gestapo in the interest of his own self-protection. 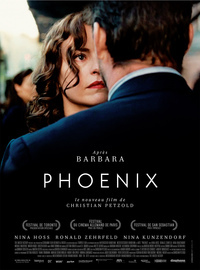 As with most of Christian Petzold’s previous films, Phoenix sets up a pulpy genre premise only to strip it of incident and transform it into something like a primal myth. Here, it’s a re-working of Vertigo that privileges the female perspective and pays as much attention to exploring the re-establishment of both Jewish and German identities post-Nazis as to romantic obsession and over-dependent relationships. Lene desires to escape with Nelly to Israel to start over in an entirely Jewish society. She’s reluctant to trust Johnny again and is determined to keep them separated, firm in the belief that to try to return to pre-war innocence would be naïve, a wilful erasure of painful memories that need to be learned from. Nelly’s attitude towards him is more complex. Although she seems to believe that he may have betrayed her, she’s so nostalgic about her pre-war life that she’s willing to look past his desperate actions. Furthermore, it’s implied that she’s dangerously emotionally dependent on him and can’t conceive of a way of reconstructing her identity without his validation. She believes that allowing herself to be moulded by him into his image of his beloved will also re-kindle his desire for her. As the one who truly knows the reality of the situation, she holds the most power, but she continuously chooses to remain in a position of subservience to him. As he guides her on how to act more like her previous self, her self-image begins to be altered. Johnny and Nelly’s mutual tunnel vision is largely a mechanism of avoidance; they both fruitfully wish to revive an idealized image of the past through aesthetic means in order to overlook monstrous atrocities they either experienced or - in Johnny’s case - were complicit in. The plot may unabashedly require a heavy amount of suspension of disbelief, but Petzold’s style is minimalist and remarkably economic. Unfolding mostly as a series of slow dialogue scenes within dimly lit, claustrophobic interiors, the camera is patient and non-hysterical. Because Petzols cleanly lays out all the important information and quickly lets the audience know how much the characters know, we not encouraged to anticipate future narrative developments so much as soak in the nuances of interactions as they happen. This review was published on July 07, 2015.